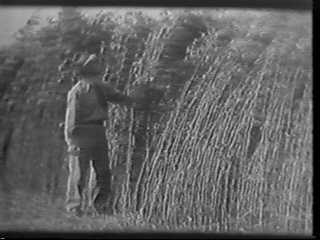 Fibers needed to make rope, textiles and other materials were in such short supply during World War II, the U.S. government temporarily re-legalized hemp cultivation so American farmers could grow it for the war effort. Although the government allowed more than 350,000 acres (550 square miles) of hemp to be cultivated during World War II, the U.S. experienced no increase in marijuana use during that period. 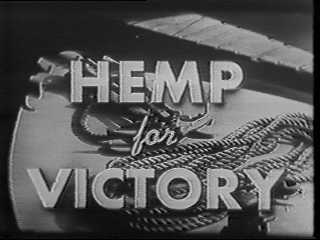 Left: Introduction to the U.S. governmentís 1942 pro-hemp film titled Hemp For Victory. Right: A farmer inspects his 8-foot-tall hemp crop, which is nearly ready to harvest. The surrounding images are from the 1942 U.S. Dept. 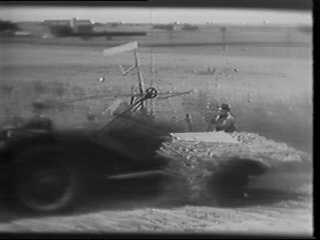 of Agriculture film titled Hemp For Victory, which was used to educate American farmers about growing hemp for the war effort. This film portrays the hemp plant in a very positive light. For years the government denied it made this film, and records of its existence in The Library of Congress were mysteriously missing. But in 1989, after an exhaustive search of government archives, researchers uncovered the original library records which prove Hemp For Victory was produced by the U.S. government. Video cassette tapes of Hemp For Victory are now available for sale to the public. 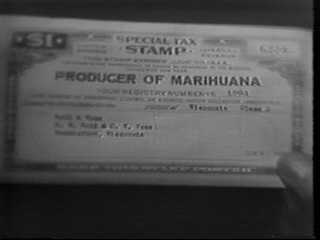 Left: A Marijuana Tax Stamp permitted American farmers to grow hemp during World War II. Right: A Wisconsin farmer harvests his hemp crop in September. DO HEMP ADVOCATES HAVE AN AGENDA TO RE-LEGALIZE MARIJUANA? Many prohibitionists discredit the need for a hemp industry because they fear hemp is being used as a vehicle to re-legalize marijuana. The facts must be judged on their own merit. The economic and environmental benefits of hemp are very real. There are literally thousands of American farmers who want to grow industrial hemp. The repeal of Hemp Prohibition is also advocated by numerous major farm organizations, including the conservative 4.5-million-member American Farm Bureau. Many businesses are now producing hemp-based products and some large American corporations (e.g., International Paper, Inc.) are beginning to advocate the repeal of Hemp Prohibition. It is entirely possible to repeal Hemp Prohibition without re-legalizing marijuana because hemp grown for industrial use has no drug properties. China and Eastern European nations are the world's leading growers of hemp, but marijuana is still illegal in those nations. Although marijuana is illegal in Canada, England, Germany, and Australia, those nations have recently begun growing hemp for the first time in decades. If the United States does not repeal Hemp Prohibition, a significant economic and environmental opportunity will be lost--the benefits will be reaped only by America's economic competitors.